As he approaches the home straight, Mazaaki Suzuki could be forgiven for resting on his laurels. But no, this 47th volume of his Bach Cantata Cycle is as good as any of its predecessors. 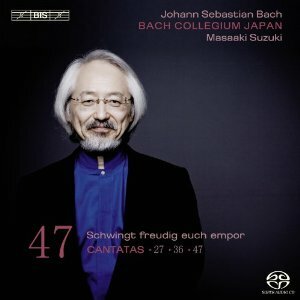 There are plenty of surprises here too, in fact Suzuki and Bach make a good team. They are both endlessly inventive musicians, but both have a real sensitivity to the necessary balance between continuity and innovation in liturgical music. 'Schwingt freudig euch empor' BWV 36 is a large two-part Cantata for the first Sunday of advent. (Curious then that BIS should choose to release the disc on 29 November, the day after the celebration in question.) It is a great piece and contains perhaps the finest of Bach's many settings of the Luther choral 'Nun komm, der Heiden Heiland', this one a duet for soprano and alto (counter-tenor). The Cantata is an ambitious work on many levels, and poses a number of tricky musical problems. The obbligato instruments are a pair of oboe d'amore, instruments not known for their soloistic potential. The principled stand by BIS against post-production jiggery-pokery means that Suzuki has to find his own solutions to the balance issues in the opening chorus, where his two alto woodwind instruments are up against the full weight of the choir. Fortunately, the players, Masamitsu San'nomiya and Yukari Maehashi, both have a rich but focussed tone that carries across almost any ensemble. And anyway, Suzuki is clearly just as concerned to project the sound of the continuo here. In general, the recording quality on this disc is excellent, but no individual line is ever exaggerated. The textures can sound a little flat when listening at mid or low volume. But turn it up a notch or two and the whole thing comes to life. The scale of 'Schwingt freudig' is demonstrated by the fact that it involves all four of the soloists. They are a diverse group, and none the worse for that. The 'Nun komm, der Heiden Heiland' succeeds partly because of the contrast between soprano Hana Blažíková and counter-tenor Robin Blaze. Blažíková has a fairly operatic tone, with lots of colour and projection, although thankfully only the bare minimum of vibrato. Blaze has a more collegiate sound, surprisingly grounded for a counter-tenor, but with plenty of energy and no problems at all with the top notes. Satoshi Mizukoshi is one of the very few Japanese vocal soloists to have appeared on Suzuki's Bach Cantata cycle. Why so few? Who knows, but I dearly hope it is not because the label thinks Mark Padmore and co. move more units. Mizukoshi is great. He has a very heady voice, but it is clear, precise and has an even tone right across the range. Some may find his performances here a little anonymous, but not me, I think this is exactly the amount of personality a tenor needs for the baroque repertoire. Mind, I understand he also specialises in the Evangelist roles in Bach's Passions, so I hope he has a bit more charisma saved up for those appearances. Bass Peter Kooij has just one aria in the first Cantata, but has more to do in the second 'Wer sich selbst erhöhet, der soll erniedriget werden' BWV 47. I'll confess to having mixed feelings about Kooij's recent contributions to this cycle; he's not a young man, and by comparison with his earlier Bach Cantata appearances under Herreweghe he can seem a little underpowered these days. But then, he was always a soft-toned singer, so perhaps the change is minimal. In fact his singing here is very good, and his soft, round tone adds another dimension of contrast to the line-up of soloists. There are just one or two points though, where the support he gives to longer, lower notes highlights a lack similar stability in the higher passage work. The Cantata BWV 47 is for the 17th Sunday after Trinity, so (unusually for this cycle) we jumping around the liturgical calender on this album. However, all the Cantatas are from the same year, 1726, and there is a certain continuity of style. However, both the second and third Cantatas on the disc are of a more modest, or at least standard, scale in comparison with 'Swingt freudig'. So the contribution of the choir gradually reduces as the disc goes on, which is a shame because they are great, precise as ever and producing a real range of timbres and textures. 'Wer weiß, wie nahe mir mein Ende' BWV 27 takes us back a week, to the 16 Sunday after Trinity. It is the shortest Cantata here and also the most sombre. The orchestration includes a horn, though we don't hear much from him, oboe and oboe da caccia. The textures are quite compacted around the middle register, but as before, just turning the dial up a notch or two brings all the clarity the music needs. The third movement of the Cantata is a counter-tenor aria 'Willkommen! will ich sagen' and it's a real tough sing. The voice is above the obbligato da caccia almost throughout and most of his phrases are long, loud and high. Once or twice you can hear Robin Blaze struggling at the ends of phrases, but on the whole it is a heroic effort. But just when he thought it was all over, what this? There is a bonus track on the end of the disc which is the same movement but with organ rather than harpsichord continuo. Suzuki explains in his (as ever) comprehensive performance notes that there is some ambiguity in the sources about which instrument to use, so he has decided to record it twice. As it happens, the results bear out the decision; the continuo part is in fast quavers throughout, so playing it on a sustaining rather than a percussive instrument creates a completely different atmosphere. But poor old Robin Blaze! Actually, his second performance of the aria is better, partly due, I suspect, to the reduced competition from the instrumental ensemble. So, another fine instalment from Suzuki and his team. I'd say this disc is a must for Bach fans, and for anybody interested in what high end audio can do for the baroque repertoire. And just one last mention for that 'Nun komm, der Heiden Heiland' setting – wonderful, wonderful music presented by performers at the top of their game and recorded in the best audio that modern technology has to offer. If you're in two minds about this disc, that one track should be the decider.